Elephants have always attracted me. 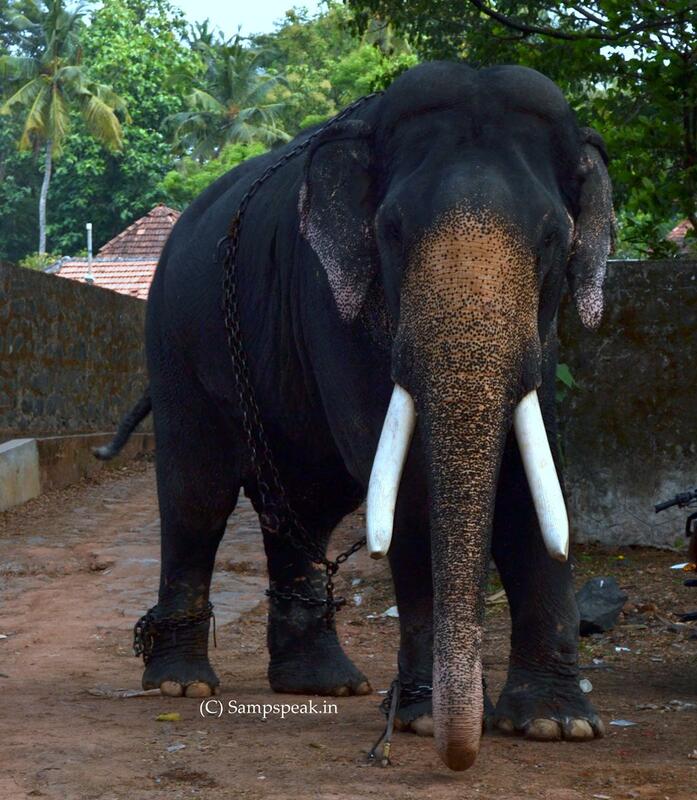 For ages, temple elephants have been a vital part of temple ceremonies and festivals especially in South India. In Kerala, they have a pride of place – as evidenced by the Pooram festivals or the Punnathur kotta, the place for temple elephants at Guruvayoor. Residents of Triplicane will ever remember the great majestic beautiful tusker named “Azhwar” about whom I have posted in detail earlier. Elephants have been the central theme of many films : Yanai Pagan, Yanai valartha Vanampadi, Nalla Neram, Ram Lakshman, Annai Oru Alayam, Kumki; more beautifully portrayed in some Malayalam movies like - Aanachandam, Gajaraja Manthram and the ultimate Guruvayur Kesavan … the love of the film industry dates back to 1937 movie ‘Elephant boy’ made at the London Films studios at Denham, and in Mysore. Elephants are not exactly happy ! - the illegal trade in animals and their body parts has been going on for decades. Black markets have been brimming with pangolin scales; elephant ivory, tiger skins, rhino horns and exotic pets for years, but more recently, a new fad has been emerging as Asia’s elephants are being poached for their skin. Hidden in the dense forests, Myanmar’s elephants are witnessing a drastic decline as they succumb to this growing, illicit trade. Ranked the fourth largest global illegal trade after drugs, arms and human trafficking, illegal wildlife trade is a sophisticated business with an even more sophisticated distribution network. The escalation of poaching, habitat loss, human-elephant conflict and mistreatment in captivity are just some of the threats to both African and Asian elephants. Working towards better protection for wild elephants, improving enforcement policies to prevent the illegal poaching and trade of ivory, conserving elephant habitats, better treatment for captive elephants and, when appropriate, reintroducing captive elephants into natural, protected sanctuaries are the goals that numerous elephant conservation organizations are focusing on around the world. World Elephant Day asks you to experience elephants in non-exploitive and sustainable environments where elephants can thrive under care and protection. On World Elephant Day, August 12, express your concern, share your knowledge and support solutions for the better care of captive and wild elephants alike. This year on World Elephant Day, a giant ice sculpture will be left to melt in the New York sun to draw attention to the dwindling population of African elephants. It’s part of a global campaign called Don’t Let Them Disappear by South African liquor brand Amarula and conservation group Wildlife Direct to highlight the rate at which African elephants are being poached. A lifelike massive ice sculpture of an African elephant will be on display in union square from 7 am on Saturday and its 85 blocks of ice will be left to melt in the summer sun; a symbol of the animal’s dwindling numbers. According to Wildlife Direct, there are approximately 400,000 left in the world, with one lost every 15 minutes to poachers. To reinforce the message, bottles of Amarula liqueur will be released for sale without the iconic elephant on the label. The trust will donate $1 for every bottle sold between now and the end of the year to support anti-poaching efforts. As recently expressed by one of Kenya’s foremost supporters of elephants, the First Lady of Kenya, Margaret Kenyatta, only a sustained global effort can save them. Elephants have lived in coexistence with human beings in Africa for millions of years. They are part of our natural environment our culture, our identity and our heritage. The event in Union Square is intended to highlight the critical role that America and other consuming countries have to play, both by reducing its own ivory consumption and by building pressure for a global ban on ivory trade. On an African level, poachers can only be defeated by adopting a continent-wide approach. Otherwise, when controls are tightened up in one country, poachers will simply relocate to neighbouring countries to continue their gruesome work. During the current election campaign in Kenya, armed invaders have wreaked havoc in some parts of Laikipia, undoing years of patient wildlife conservation work. Not a single arrest has been made. African elephants are the largest terrestrial animal left on the planet. They live in close-knit families, and develop lasting friendships. They mourn their dead, meet up for reunions, and go to extraordinary lengths to protect other, young and vulnerable elephants from harm. To know elephants is to fall in love with them. It seems unthinkable that wild elephants should disappear. How can we make sure it doesn’t happen? I love elephants and this is a post to express solidarity with the groups engaged in protecting the wild elephant.